The Panasonic ES-LV61-A offers a close and comfortable shave, and features a useful and intelligently thought out sonic cleaning mode. It’s designed to reduce skin irritation and shaving time, giving you the convenience of a clean and fast shave. Time is important, and nobody wants to waste any. The blades of this shaver are built in such a way that it will be far more efficient than competing models. Like the ES-LV81-K, it features a 5 blade cutting system. The blades have a 30 degree bent in order to efficiently shave all the hairs without the need of a second stroke. If you have a dense beard, you might have to insist in some places. It’s fairly easy to use. The only control button it has is nicely designed and integrated in the front of the razor. The sole purpose of the button is turning the shaver o and off. You can also block the shaver turning the ring around the button to the side, preventing the shaver from turning on accidentally. Below the button, you have a led screen that fits perfectly into the general design. It’s pretty straightforward as well, showing how much battery you have left. Is the ES-LV61-A right for you? It’s perfectly suited for men who have some problems with in-grown hairs especially. After a few shaves with this device, you’ll notice how the problem easily fades. It’s also well suited for men who have sensitive skin. It’s not one of the most aggressive shavers, so you will not have to worry about razor burn. The Panasonic ES-LV61-A is pretty safe from this point of view. 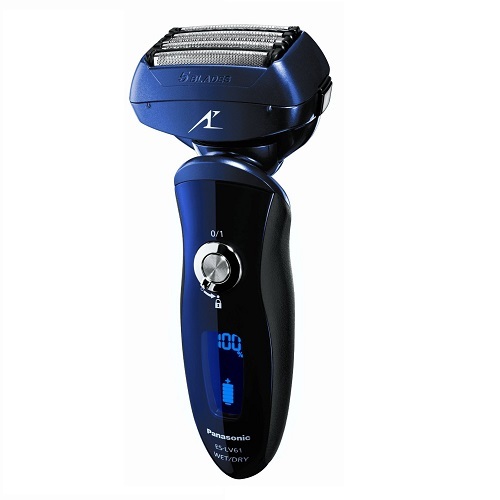 Of course, you don’t have to necessarily have sensitive skin or fight with ingrown hairs to benefit from this shaver, but if you do have one of those 2 situations, this might be one of the best choices that you can make. What’s improved over a 4-blade model? The ES-LV61-A is a little lighter than the 4-blade LA63 model and it’s also better balanced. It obviously has a 5th blade, which makes it even faster and ore precise than the former model. The all-around feeling that you have when holding both the former and actual model is that Panasonic has made some serious efforts to make the ES-LV61-A leagues better than its ancestor. Everything looks really high quality and feels that way too. The only thing, with Panasonic electric razors when compared to Brauns is that they will not operate while being charged. So, if you forget to charge your razor once the battery’s dead, you will have some trouble when you find it not working before you have to go to work. Even leaving it for 5 minutes to charge will not be enough for the shaver to have enough power to give you a decent shave. So, always remember to charge your razor. If you charge your razor in your bedroom and are a light sleeper, you will not be disturbed by its led screen showing 100% battery forever once it’s charged. This is a nice improvement over the former model. There’s not much you could say about the Panasonic ES-LV61-A that would be a weakness. The only thing some customers have complained about is the fact that the sideburn tool does not extend too much and is hard to be seen behind the head of this razor. All in all, this is a really nice shaving tool. More than delivering a comfortable and close shave, it will also save you a lot of money that would have spent on shaving otherwise. If taken care of, this is a shaver that will last for years. Next post: What are the Best Beard Vitamins?